There are so many toys that have become timeless. Toys your parents played with, toys you played with, toys your own kids will play with. As I’m soon to be a dad myself, I got to thinking about these toys that have become ubiquitous, that have spanned the generations to be enjoyed by different children in different eras. Here are some of our most famous toys that have been around for decades and look to be around long after all of us are gone. 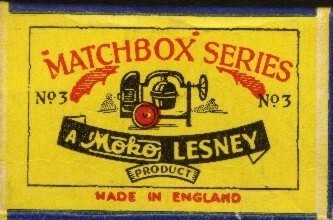 Matchbox die cast cars – Matchbox cars were started in 1953 by British toy company Lesney Products. Co-owner Jack Odell created the idea for the tiny cars because his daughter was only allowed to bring toys to school if they could fit in a matchbox. 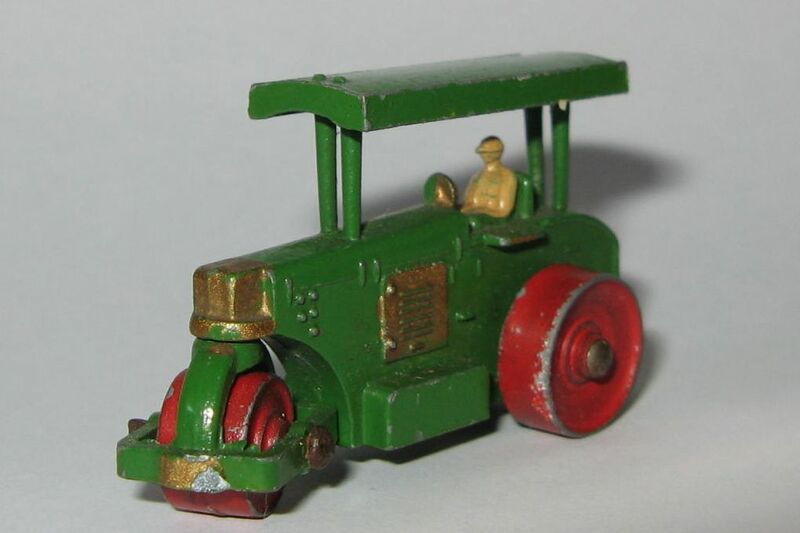 So he decided to scale down one of their larger toys, the red and green road roller, and that became the #1 1A Diesel Road Roller (pic above), the first Matchbox car ever. A dump truck and a cement mixer would complete the first 3 cars in what would come to be known as the original “75 series” of Matchbox cars. The website darkens.net.nz is a great resource for pics and information on vintage Matchbox products. Hot Wheels die cast cars – As seen above, Lesney dominated the small die cast car market from the time they introduced Matchbox cars throughout the ’60s. 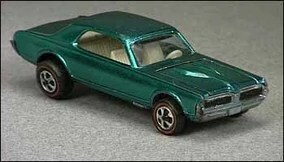 Mattel decided to throw it’s hat in the ring to grab some of that die cast money with it’s Hot Wheels line in 1968. 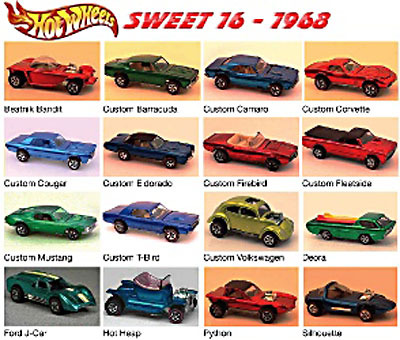 That series of cars in 1968 has come to be known as the “Sweet 16” (see pic on left via Worthpoint.com). They were all released at roughly the same time, but the first numbered car was #6205a – The Custom Cougar (pic on right via Hot Wheels Wiki). Barbie – A Mattel executive’s wife noticed that all girls’ dolls looked like infants. There were no adult female dolls for kids to play with. When she brought this up to her husband he and the rest of Mattel were unenthusiastic about the idea. I mean, she was just a woman, what the hell did she know about dolls? Am I right? Anyway, on a trip to Europe the wife came across the German Bild Lili doll, which was an adult female doll based on a popular comic strip character. She bought three, brought them home to America and worked with Mattel engineer Jack Ryan to create the first Barbie doll which was named after her daughter, Barbara (see pic above). Barbie was introduced at the 1959 Toy Fair in New York. Retailers were reluctant at first but within a year the dolls were selling out of stores across America. Ken was introduced in 1961 (named after Barbara’s brother) and then Skipper in 1964 (no idea where that name came from). 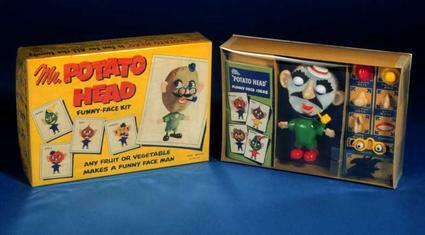 Mr Potato Head – In the late ’40s George Lerner created a set of plastic face pieces that could be stuck into a variety of fruits and vegetables to make a “funny face man”. The idea was based on games he’d play with his sisters involving creating funny characters out of food. When Lerner shopped the “funny face” pieces around in 1950, it was rejected by nearly every company due to food rationing by the war making playing with your food seem wasteful and irresponsible. Lerner convinced a cereal company to buy the pieces and put them in the box as premiums. Then in 1951, textile manufacturers Hassenfield Brothers (later, Hasbro) saw the product, liked what they saw and decided to buy the license from Lerner as well as pay the cereal company to stop production. The newly dubbed Mr Potato Head (pic above) debuted in May 1952 and was a rousing success. It was such a success that it became the first toy advertised on TV as well as the first toy that marketed directly to children (as opposed to the parents). At first, only the plastic face/hair/hands/feet pieces were included. Parents had to supply the potatoes for their new child’s toy. I guess rotting Mr Potato Head corpses in kids’ rooms was a less than ideal situation, so Hasbro started including molded plastic potato bodies for the first time in 1964. Read more about Potato Head’s history here. GI Joe action figures – The original release of GI Joe action figures was a direct result of the popularity of Barbie. Hasbro reasoned that if girls loved to play with a female doll, then boys would love to play with a guy doll. However, since boys are awesome, they want to play with something badass, and dolls are the exact opposite of badass. So Hasbro coined the term “action figure” and released the original 4 figure assortment of GI Joe “action figures” in 1964. Each of those first four figures represented one branch of the military (see pic above). The concept would change to “GI Joe Adventure Team” in the ’70s in order to de-emphasize the military angle (I guess mercenaries for hire is a more acceptable angle). Then in the mid-’80s the line would be gloriously reborn as 3 3/4″ figures and dubbed GI Joe: A Real American Hero, once again coming full circle and being all about the military, laser guns and blowing stuff up. Baseball cards – The earliest known American baseball card was distributed in 1869. It is known as the Peck & Snyder Cincinnati Red Stockings card (see pic above). It features a picture of America’s first baseball team, the Cincinnati Red Stockings. Peck & Snyder was a major baseball equipment manufacturer and this card was a way to advertise their business. On the back of the card was an advertisement for Peck & Snyder products. The Peck & Snyder card was just one card. The first official set of American baseball cards was released in 1886 by Old Judge cigarettes. The set features famous players of the time in a sepia toned print derived from a woodcutting. On the back of the cards were advertisements for Old Judge cigarettes. Honestly, when I started to research this, I thought the infamous 1910 T206 Honas Wagner card by the American Tobacco Company was the first baseball card. I, apparently, was wrong. And that never happens. Comic books – The first comic book known to be printed in America was The Adventures of Obadiah Oldbuck in 1842 (far left). It was a 40 page hardback measuring about 8.5″ x 11″. It contained illustrated comic stories and was an American printing of a french comic. The “modern” format of comic books began with a comic called Famous Funnies. 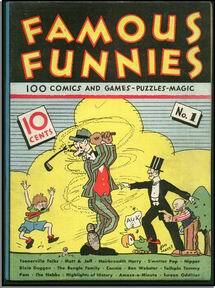 Eastern Color Group published Famous Funnies: A Carnival of Comics in 1933. This book was, for the most part, given away as a premium in department stores. Then, in 1934, Eastern Color Group would release Famous Funnies #1 which would contain some original comic strips and be sold through retail outlets for 10 cents. It’s popularity sparked a boom that is now called the Platinum Age of comics. Pez and Pez dispensers – Eduard Haas invented Pez in Vienna, Austria in 1927. The name comes from the first, middle and last letters in the German word for peppermint (Pfefferminz). 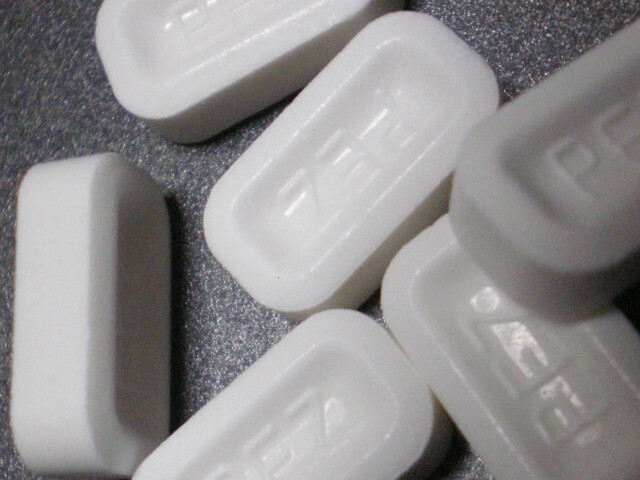 Pez was originally marketed to smokers to freshen their breath, so it stands to reason that the first Pez dispenser in 1947 looked like a cigarette lighter. In 1948, the dispenser changed to the taller, plastic shape we are familiar with today, but they still had a head similar to a cigarette lighter (see pic on right). Then, in 1952, a Pez executive, Curtis Allina, came up with the idea of putting character heads on the Pez dispensers. Some of the first characters used were Popeye, Santa and several different Disney characters (Mickey Mouse, Donald Duck, etc). This entry was posted on June 4, 2010 at 9:00 am and is filed under Americana, nostalgia, pop culture with tags nostalgia, pop culture, toys. You can follow any responses to this entry through the RSS 2.0 feed. You can skip to the end and leave a response. Pinging is currently not allowed. All awesome – great post! My favorite is the Mr. Potato Head. Seems almost bizarre now! What a great post! This is the first time I’ve seen many of these originals. Neat! OMG, youre going to be a daddy?? I didnt know that! Congratulations! One month after the fateful flight from London to Paris, Herm. person. Fendi and Prada are at the higher end of the designer scale. I stumbledupon it 😉 I’m going to come back yet again since I saved as a favorite it. I am sad because Hot Wheels don’t look as realistic as they used to back in the day. Thankfully Matchbox do! Wrote an article about various die cast toys (siku, majorette, rmz city, welly and others) called Matchbox vs Hot Wheels vs Majorette Toy Cars, check it out and please share your thoughts.